My little daughter "killed" some of our pictures on our camera. My cousin advised me to try Flash File Recovery and restore the photos. I restored them all, and found some other very old pictures on my camera. I was really surprised because I had lost these pictures on my PC before. Thank you! My camera was out of power and something happened with my Secure Digital Card - it didn't show any shots. 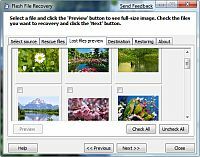 With your program, I restored all my photos. ThanX!